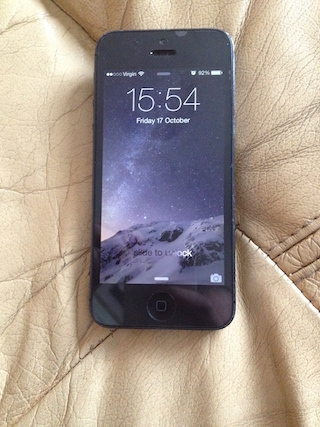 I recently had the opportunity to upgrade my iPhone 4s to an iPhone 5 for a very reasonable price. It was too good to give up, so I grabbed a black, factory unlocked 64 GB version. My 4s has been a very reliable handset, and it handles iOS 8 very well, but it doesn’t do well to sit too long in the iPhone market. The iPhone 5 is a very slick device. The most obvious change is the taller screen. A 4” screen with an extra row of icons over the 3.5” of all previous models. It is slimmer than the iPhone 4s, but it does feature the same band around the edge holding the antenna points. The power button, silence switch and volume buttons are virtually the same, just a little smaller. The headphone socket has been moved to the bottom, and also on the bottom are redesigned grills for the speaker and microphone. The 30-pin dock connector has been replaced by the newer smaller Lightning connector. 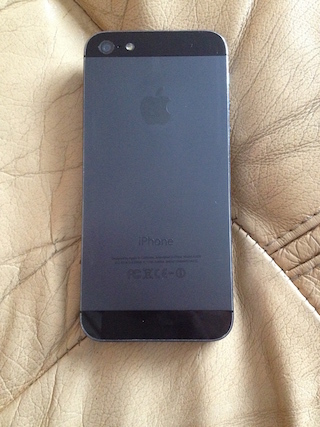 The shiny all glass back of the iPhone 4 and 4s have been replaced with a two tone black and slate on the black model (white and grey on the white model). Speaker volume, call quality, and WiFi strength have all been improved on the iPhone 5. Within 30 minutes of using my iPhone 5, I noticed a vast improvement in cellular signal strength; this was a welcome change, as I quite often struggled to keep a call with my 4s in some places,- as well as the WiFi reaching further. iPhone 5: 1.3 GHz dual core A6 processor, 1 GB RAM, 4” 1136 x 640 pixel screen, PowerVR SGX543MP3 graphics chip, 8 megapixel camera with a 1.2 megaxpixel front facing camera, 1440mAh battery, AirDrop support, and a nano-SIM slot. Benchmarking at 1654.
iPhone 4s: 800 MHz dual core A5 processor, 512 MB RAM, 3.5” 960 x 640 pixel screen, PowerVR SGX543 graphics chip, 8 megapixel camera with 0.9 megapixel front facing camera, 1430mAh battery, and a micro-SIM slot. Benchmarking at 622. A while back I wrote a mini review of the iPhone 5c. The only difference between the iPhone 5 and iPhone 5c is the outer casing. The iPhone 5c, released in 2013, has a plastic outer shell available in a variety of colours. The iPhone 5c does also have a slightly bigger battery at 1507mAh vs. the 1440mAh in the iPhone 5. However, everything else is the same. It does beg the question why Apple replaced the iPhone 5 so quickly with another product of the same specs. When Apple released iOS 7, performance on the iPhone 4 (the lowest iPhone to support iOS 7) was bad, which was partly rectified with iOS 7.1. When Apple released iOS 8, performance on the iPhone 4s (the lowest iPhone to support iOS 8) was very good. However, iOS 8 really comes in to its own on the iPhone 5. The processor is clocked at nearly twice the speed and has double the amount of RAM, which makes the iOS 8 experience wonderful on the iPhone 5. There is zero lag, animations are smooth, and performance in apps is greatly improved. I would also say this would impact on battery life. In the short time I have used it, battery is definitely better than the iPhone 4s. When a device struggles or is put under more pressure (a.k.a. having a newer, more feature laden operating system) this can affect battery life. I am totally in love with my iPhone 5. Its design and performance are superb. I have heard all the horror stories regarding buttons, cameras, and screens failing plus the fact they scratch very easily – however I have only met one person with a fault with theirs, that being the power button. It feels nice to finally have a ‘current’ iPhone rather than lagging behind. Okay, so it might not be currently sold by Apple, but it has the same hardware as the iPhone 5c. This should also match the iPhone 5 in the long run in terms of support. 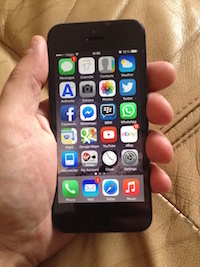 For further iPhone 5 reading, check out my ‘what does the future hold for the iPhone 5‘ article.